After 8 years since last time and 30 since the first time, here I am again writing about a new performance of one of the major artists that most have signed the last 30 years of Rock music. A "warm up" that has the double aim to present his latest work UP and to prepare the world tour which will start off in North America from next november , coming back to Europe during the first six months of 2003. 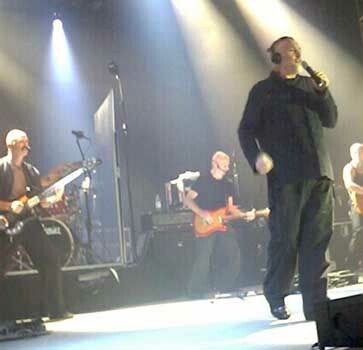 I saw Peter Gabriel and his group playing at the venue Alcatraz in Milan on 16 september, on the first of the two shows scheduled (the second show on the 18th) after only two other gigs: Monaco and Arzachena, a wonderful show in a square, decided in the last minute. However, the 16 sept. Show can be considered the real start of this warm-up mini-tour; as Levin writes on his site, this can be considered the very first show after 8 years of small shows all over the world. As the doors were expected to open at 07.00 pm, I got to Alcatraz at 05.00 pm, and there were already a few people waiting outside. Waiting was long but pleasant, chatting with everybody there, while more and more people arrived. The age went from 20 to 50 years old, meaning that Peter is loved not only by old Genesis fans, but also by who hadn't even been "programmed" yet at the time he used to sing The Knife or Back in NYC. Around 7.15 pm the doors opened at last, we entered the venue and I conquered a second row seat, actually a first row as, for the first time in my life, I was lucky enough to have in front of me a girl not too tall. I'm on the left, 4-5 metres from Peter's microphone. After 30 minutes Alcatraz is full. On the stage the instruments of Spaccanapoli are ready too. This group will open the gig, as usual with Peter's shows, one hour before. At 8.15 pm the group from Naples starts to warm up the audience (as if it was needed !). At last, just after 9.00 pm, Peter and his band entered the stage. A little fatter, with his white goatee and few hair, totally dressed in black, he's supported by his daughter Melanie (vocals), Tony Levin (bass), Ged Lynch (drums), Rachel Z. 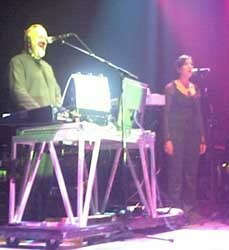 (keyboards), David Rhodes (guitar) and Richard Evans (guitar and flute). At his side a thermos and a cup where someone will pour a hot beverage that Peter will drink before every song. A greeting, the song title announced, and he starts off with Darkness, difficult start that gets the crowd already involved. The song is well played, even if we feel that the band is not yet at its 100%, and Peter and Tony will guide the others with glances and gestures during the entire gig. After the first drink, Peter announces one of his classic songs Red Rain, and the ovation from the audience demonstrates how involved it is. Follows the wonderful Growing up, played really well, with Tony in full evidence. No way out precedes the splendid Mercy street, very fascinating song, not often played before an audience. At this point Peter introduces My head sounds like that, saying that the song is played live for the first time; some insecureties and a pair of late entries confirm that the band is not yet well inside this track, really very compelling. Then comes the well known by now The Barry Williams show, involving and well played. The beautiful More than this, which is among my favourite songs written by Peter, is played in a different way than it is on the CD; the mix of vocals has been changed, Peter and Melanie alternate the strophes, exchanging the first voice and the higher one, while the leading vocal is always Peter's. The orchestration is nevertheless wonderful: a pearl! Another classic follows: Diggin the dirt and at last Peter leaves his place behind keyboards, coming to sing in the middle of the stage, while the whole audience sings a-long. At this point Peter announces Animal nation, an unrealeased song that makes the show even more exclusive; this song seems taken from the US period, with some parts recalling the SO sound. The show ends with Sledghammer, sung by the entire hall. Strongly called back on stage, the first encore is In your eyes, no need to mention how the audience is involved, with Peter dancing - as usual - with Tony and David on front stage. Even if Youssou N'Dour is missing, the song played tonight is more like the live version than the studio one. The second and last encore sees Peter on piano and Tony on bass for a suffered Father and son that ends this unforgettable evening. Willingly, I have not technically considered each single song, as this show must be taken in his whole, considering the targets it has been put up to reach. The target "warm UP" I have to say has been reached, of course the mix between elements must be improved, but, reading about previous shows, i think that strong improvements can already be seen. The set list presented is certainly a good visiting card for UP, excellent work if not the best of his discography, but we have missed songs from the first works. Years go by, the body feels the influence of time, but apart being a little more static than before, I think that Peter has worked hard on his voice; we have heard his usual indecisions (late starts or words forgotten), which have always been present in his shows (I remember a show in 1974, he was about two seconds late entering his vocals on Watcher of the skies), but his voice is perfect, mature and I should say more sure than before, above all on the high tones. 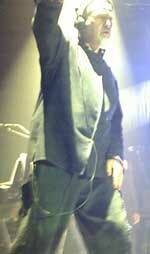 Unlike previous gigs, he has been very busy on his electronic equipment, as the songs of UP require. I don't think that the group is at the same level of the previous ones; Melanie is clever, but was very very excited, she did her job anyway. 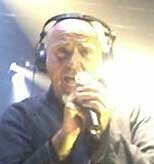 Tony has been, as usual, one of the columns of the band, always excellent and precise, completely inside the sound. The other ones: the nice and always present Rhodes, with his usual limits; the good Lynch which has carried out his part, but cannot be compared to the great Manu Katche; the marginal Evans (excellent only on the flute pieces), and a insufficient Rachel Z., which I think that can't improve so much to reach her forerunner Jean Claude Naimro. At the end � the show. Like every Peter Gabriel show I attended, it has been involving, exciting, new, full of intense and delicate moments, full of strength and sweetness, rage and sadness, hope and consciousness; he made the crowd feel as one and in the same time he created a bridge between himself and everyone of us; something that only his way to be and his music can do: unity and singularity transmitted by his presence and his musical messages. An enourmous example of what music really is and how it must be played. And, to repeat his own words � in the future we'll see and hear � MUCH MORE THAN THIS.